At the end of Goodramgate, you come to this staircase leading up into Monk Bar, the strongest medieval defense tower along the city walls. 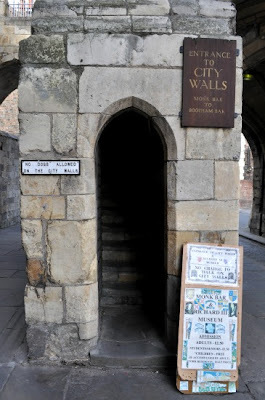 The Richard III Museum is at the top of the steps, housed in the tower, and from here you can also walk the walls to Bootham Bar. 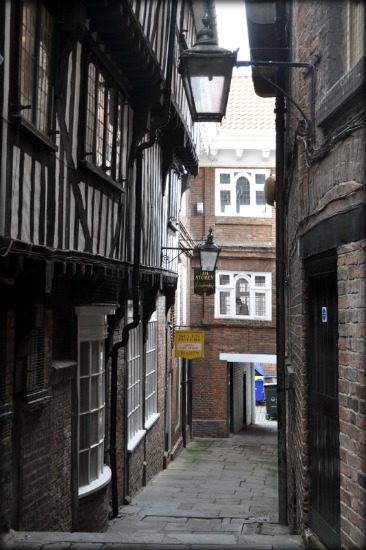 This snickelway was once called Bacusgail (1312) or Bakehouse Lane. but was later renamed after the wife of a former Lord Mayor of York. There's a mini food festival on in York at the moment. 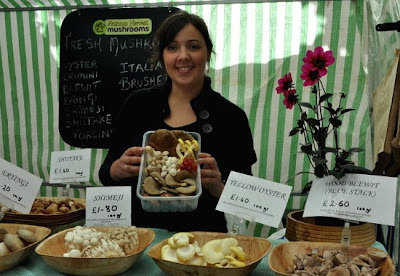 The Autumn Harvest Mushrooms stall in particular caught my eye because of the wide variety of mushrooms on offer there, both fresh and dried. They're based in South Yorkshire, and can often be found at farmers' markets across the county. The photo of the benches I posted yesterday overlooks this public garden, which is off Peasholme Green opposite the Black Swan pub. 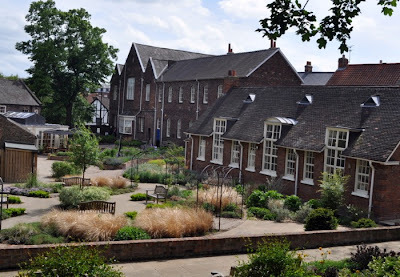 The building in the foreground on the right is the School House Gallery which exhibits contemporary ceramics, and behind it is the Quilt Museum and Gallery. The garden was recently redesigned by the York Conservation Trust. 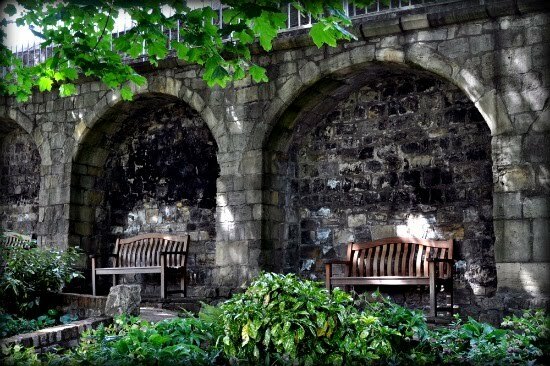 Can any Yorkies out there guess where these benches are? They're pretty hidden away and off the beaten track. A photo of the view they overlook is coming up tomorrow. That's part of York's medieval city walls in the background, with the luxury of a railing to make people walking around it feel safer. Not all parts have railings, but I think those bits are mainly where there's a grassy landing on the other side! This is one of York's snickelways, called Penny Lane, which I nipped through today taking a short cut across the town centre. I love the medieval brick on the left, and the wavy line of the Victorian wall on the right. 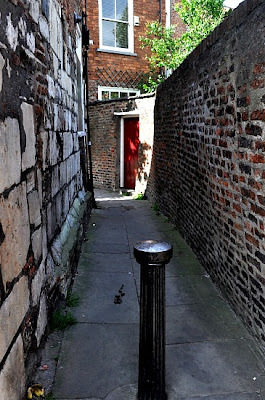 Having just looked Penny Lane up in Mark W Jones' Snickelways of York book, I've found out there are supposed to be hub-height indentations in the walls made by the wheels of hand carts people once used to wheel through here. I can't see any on my photo, so will have to go back for another look! 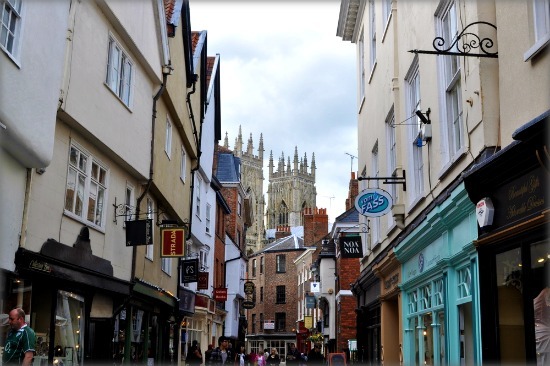 A classic York street scene, with the Minster in the background. Low Petergate has a mixture of chain stores and independents. Sign in the door of Give a Dog a Bone, another one of my favourite shops on Fossgate which sells all kinds of funky gifts and fun bits and pieces. 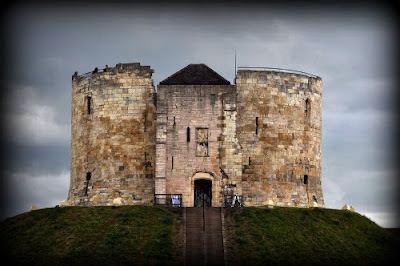 History meets nostalgia in many of the recreated rooms in York's Castle Museum. 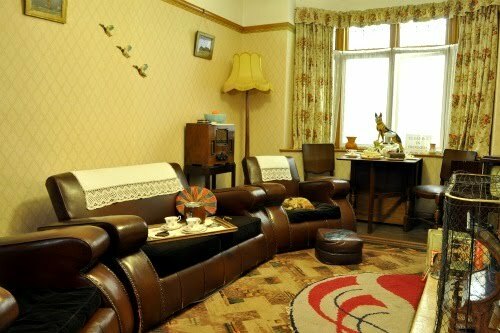 This is one of them - the 1950s lounge. I could feel quite at home in here. 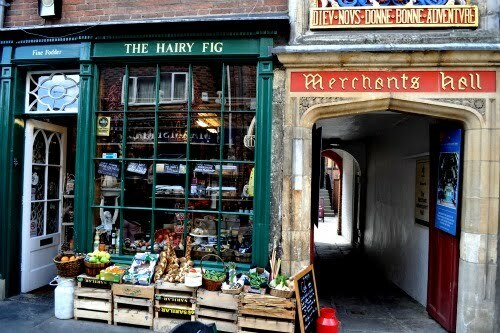 "The Hairy Fig, purveyors of fine fodder" a gorgeous little shop on Fossgate, right next to the entrance to the historic Merchants Hall. Thanks to those who left a comment yesterday and welcomed me back. After blogger's misbehaviour today they all seem to have vanished. Look, my village has a station where the man pops out of his little house to open the barriers when a train is coming. The village I live in is called Upper Poppleton. Nether Poppleton is a little further down the road. The station is just labelled Poppleton, probably so that neither village feels left out. I currently have the best of both worlds. 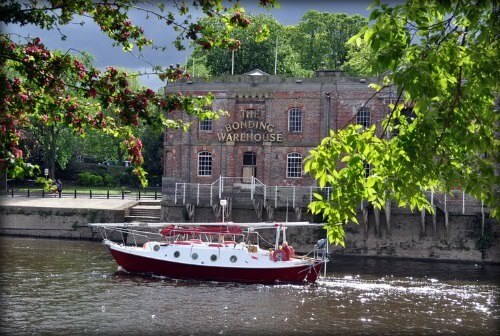 I moved in June to a village on the north west outskirts of York, with the city on one side, and open countryside on the other. It takes me literally only 5 mins by train to get into the city centre. The photo is of a section of my village's name, from the station platform. Anyone want to guess what the whole thing is? (A clue: There are 2 villages next to one another with "POPP" in the name. Say them both out loud. Mine is the one that sounds like bubble wrap popping).